Product prices and availability are accurate as of 2019-04-22 03:21:31 UTC and are subject to change. Any price and availability information displayed on http://www.amazon.com/ at the time of purchase will apply to the purchase of this product. minimal dainty geometric origami elephant necklace , best friend gift necklace, lucky charm necklace total length of the chain 15 1/2 ~ 17 1/2 inches with a lobster clasp. 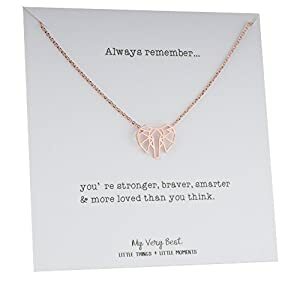 material: gold plated brass or silver plated brass or rose gold plated brass pendant size: 14 mm x 12 mm with inspirational message card "always remember...you're stronger, braver, smarter & more loved than you think."